As one of the organizers for the conference, I might be a little biased, but I had an absolutely fantastic time at the second MeeGo Conference held May 21 – 25 in San Francisco. Like with many conferences, it was the people who made it such a great experience for me. Interesting conversations with new and old friends combined with fun activities and sessions full of geeky material made for a fantastic experience. Despite getting almost no sleep thanks to some very late nights of werewolf and discussions in the hacker lounge, it was worth it! Siege Weapon Building with Live Action Angry Birds was a great community activity to help people get to know each other. We broke out into about 15 groups of 3 people each, and half of the teams built catapults for the birds and the other half built levels for the pigs. We then paired the catapults with the levels and let people launch the birds at the pigs with judging for best catapult, best level and an additional award for style. The video from Netbook News did a great job of capturing it all into a short, fun summary. I loved the hacker lounge this year, even more than the one in Dublin. By having the hacker lounge in the same location as the conference and the hotel, people were able to kick back and relax in a fun environment all hours of the day and night. It was a great place to have interesting conversations or play games with people late into the night. We had ping pong, foosball, air hockey, wii, and my favorite community building game, werewolf. I hung out with old friends, made new ones, and had a great time in the hacker lounge. If I could change one thing about the hacker lounge, I would get rid of the air hockey and television, which were a little too noisy for the space. I presented in 2 sessions: The State of the MeeGo Community with special guest Randall Arnold (aka texrat) and co-presented in Dave Neary’s MeeGo Community Dashboard talk. As someone helping to organize the event, I didn’t get to attend as many sessions as I would have liked, but I did get to a couple. I particularly enjoyed Carsten’s Transparency, inclusion and meritocracy in MeeGo: Theory and practice and an ad hoc session we had over lunch to talk about details behind the community apps. 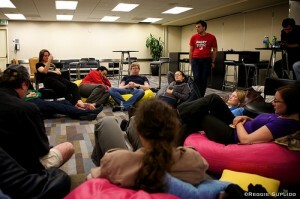 The conversations and collaboration in the hallways, over meals and in the hacker lounge were a big part of the event for me. Keynotes – enough has been said about the keynote, so I won’t elaborate here other than to say I agree with much of what others have said. Better integration of the warm-up activities. Despite working very closely with the warm-up organizing team, these still felt too disconnected somehow, and people were extremely confused about attending the warm-up before registration was open and badges handed out. Overall, I was really happy with the conference, and I appreciate everyone who took the time to hang out, chat, attend my sessions, play werewolf and much more. Thank you. Photo credits: MeeGo Conference Banner by Thomas Perl, Werewolf in the Hacker Lounge from Reggie Suplido and Maemo/MeeGo Folks in SF by Thomas Perl. 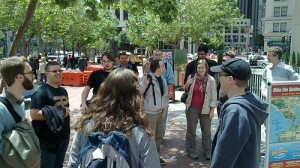 Note: This is a blog post about my personal experiences at the MeeGo Conference. 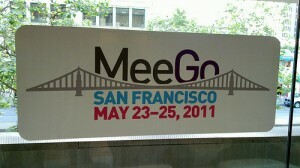 We’ll some kind of official wrap-up on the MeeGo blog next week after people recover from the conference.